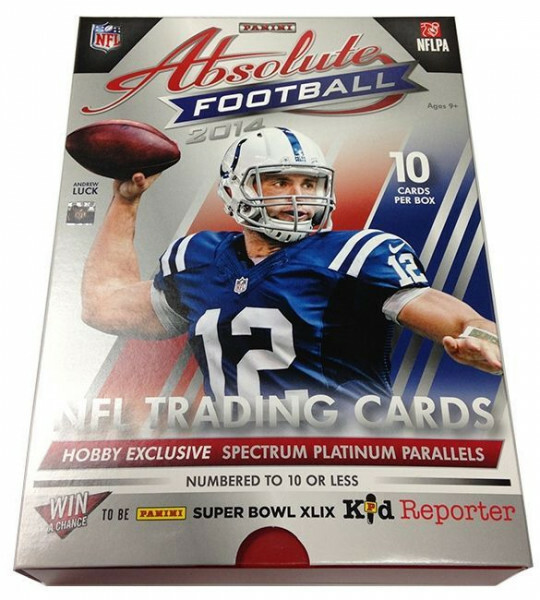 Factory Sealed 2014 Panini Absolute Football Hobby Box mit 1 Pack a 10 Cards per Pack. 3 Memorabilia Cards und 2 Autogramme per Box !!! 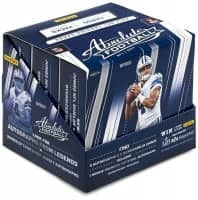 Produktinformationen "2014 Panini Absolute Football Hobby Box NFL"
Factory Sealed 2014 Panini Absolute Football Hobby Box mit 1 Pack a 10 Cards per Pack. 3 Memorabilia Cards und 2 Autogramme per Box !!! 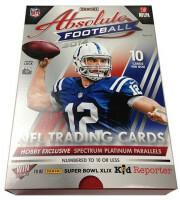 Das Box-Cover zeigt Indianapolis Colts Quarterback Andrew Luck. 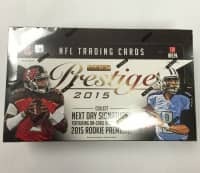 Weiterführende Links zu "2014 Panini Absolute Football Hobby Box NFL"
Fanbewertungen für "2014 Panini Absolute Football Hobby Box NFL"